Perhaps one of the least well understood periods in Swedish tank design took place in the years of 1946 and 1947. During this time the Swedish army was still unsure of what role the tank would play after ww2, but they knew a new tank would be needed for the post war period. Based on work that had started during the war, preparations would be made for a future medium tank and tank destroyer but these projects would ultimately be discontinued only a few months after the start of their development. As early as 1943 the Swedish army had started working on preparations for their next medium tank. Reports from Finland about captured T34´s had shown that even the most modern Swedish tanks were lacking in regards to firepower and armor protection, largely tanks to a 20 ton weight limit that had been in place during their development. A weight limit of 30 tons was chosen for the new tank despite mobility concerns to avoid this problem from happening again. Due to the need to get the 30 ton ready as soon as possible work had started on the basis of a reinforced and enlarged Strv m/42 chassis, the tank would also make use of the “Delat torn” turret in development for the Strv m/42. These early ideas/drafts for a 30 ton tank had been named “Pricken” by Landsverk who was handling the development of the vehicle. By the end of WW2 the Swedish army had found itself fielding 6 different types of tank, all using their own special components. This was a major issue not only in terms of maintenance and logistics but also because this system couldn’t make the most out of the limited capacity of Swedish industry. Since 1943 efforts had been made to alleviate the issue by a pushing for the standardization of components and tank types. A universal chassis using interchangeable components had been envisioned for the next generation tank and tank destroyer projects in development at the time. This had already been realized to a certain degree with the Strv m/42 and Pvkv m/43 which both shared the same basic chassis and major components, but with the end of ww2 the 30 ton projects had been re-evaluated and their development discontinued. In December of 1945 KATF (Swedish army materiel administration department) produced a report detailing their new guidelines on future tank development. Without the immediate need for a new tank as had been the case during ww2, their requirements (though still based around the 30 ton weight limit) were set much higher and it was recognized that this tank would take years to develop. Compared to the earlier designs the tank requested by KAFT would be given a lower and wider profile to make it easier to hide and to allow wider tracks. The thickness of the armor was seen more important than the sloping, but it was noted that sloped armor would be used where the thickness was limited. It was also specified that the shape of the Strv m/42’s upper side armor would be kept, and that the hull would make use of spaced armor where ever possible. All current anti tank guns were deemed inadequate as armament for the new tank as they were expected to be outdated once the tank itself would be ready. Instead a new long barreled 75mm gun with a muzzle velocity of 1000m/s, or even a 10,5 cm gun with a muzzle velocity of 850m/s would be used. Earlier ideas of using a autoloding mechanism and the “delat torn” type turret were also dropped. Pherhaps the most drastic change suggested was the use of a rounded cast armor turret. Cast armor had never been used in Swedish tank designs before but promised the advantage of a better ballistic shape and easier manufacturing. Later a cast turret design would be used for the Tornpjäs m/57 series of costal defense turrets. The report put a big emphasis on the mobility of the tank, even going as far as stating “The tank must have better mobility than even the most modern tanks of the enemy”. This was seen as such a fundamental requirement that no other element of the design could be compromised for it. The reason this was seen as especially important was that the Swedish tank brigades were mainly expected to be used against airborne or costal landings and therefore needed to be able to respond quickly to such an attack. This line of thought would later lead to a push towards even lighter tank designs and contribute to the cancellation of the 30 ton tank project. The report concluded with a set of suggested characteristics for both a 30-32 ton tank and a 30 ton tank destroyer. With the new guidelines in place KATF approached both Landsverk and Bofors in August of 1946 to preliminarily discuss how the development of new tank and Tank destroyer types should be handled. After some deliberations with Bofors the companies agreed to cooperate on the project, and Landsverk was tasked with producing a preliminary price chart for the tank and TD projects. The name Stridsvagn m/46 (shortened to LS 46) was used in this chart to represent the tank and in the same vain the name Pansarvärnskanonvagn m/46 (LP 46) was used for the tank destroyer. Interestingly the projects were offered in both 25 and 30 ton versions, and it was noted that considerations for a gun with muzzle velocity 1200m/s and a 500-600hp engine had been factored into the price. In October of 1946 a Swedish army delegation visited Czechoslovakia in order to gather information on the Czech situation after ww2. Of particular interest was Czech ideas and experiences with tank design and production, especially since Sweden had purchased and operated Czech tank designs in the past. During a visit to the ČKD tank plant the delegation got the opportunity to meet with the legendary Czech tank designer Alexej Surin. Surin proved to be very forthcoming with his thoughts on tank design and after the discussion he agreed to write down his views on what should be required of a modern medium tank. Surin had recommended a tank not too dissimilar to what had been discussed earlier by KATF but there were some key differences. For one he stressed the importance of sloped armor by stating that “About 50% of the armor thickness could be saved by the sloping of the armor”. A rear mounted transmission had been discussed in the KAFT report but it was seen as essential by Surin as it would help improve the shape of the frontal armor, a diesel engine was also recommended due to its reduced chance of catching fire. Another suggestion was that the torsion bar suspension used in Swedish tank designs should be dropped since it required more internal space than other suspension systems. Like the earlier KATF report the use of rounded cast armor plates was seen as superior for places like the turret due to their better shape. Correspondence between KATF and Landsverk continued in November with a briefing on the information gathered from Czechoslovakia. In the notes taken during the meeting Landsverk engineers began experimenting with how the Czech ideas could be implemented into their own 30 ton tank design. In order to protect against 75mm projectiles a frontal armor thickness of 75mm at 30dg had been recommended, with a side armor of 60mm and a rear armor of 40mm. To make sense of how the improved armor angles would effect the tank a rudimentary drawing was created which also noted the use of a cast turret. Curiously a unsupported interleaved suspension also appeared in these documents along with ground pressure calculations comparing the 30 ton tank to the 22 ton Strv m/42. Though it had obviously been inspired by German designs this suspension had actually been recommended by KAFT during the meeting and seemed to be the only way to keep the ground pressure within acceptable levels. As with the armor angles a drawing was created to give an basic idea of how the interleaved suspension would look on the 30 ton tank. By the end of the month Landsverk was offering that they themselves would handle the developmental costs for the new 30 ton tank and tank destroyer if KAFT agreed to order and pay for the construction of the prototypes. By this time KAFT had already begun questioning the 30 ton weight limit that they themselves had put in place with the 1945 report. There is a number of possible reasons for why this happened, first would be a purely economic one since there didn’t exist any materiel for ferrying, recovering or transporting tanks as heavy as 30 tons in the Swedish army at the time. Another reason was that as I stated before the Swedish tank brigades were expected to fight airborne or costal landings and that may have led KAFT to conclude that the ability to respond to these events as soon as possible was more valuable than the other aspects of the tank, especially since this type of attack usually didn’t allow the enemy to bring its heaviest tanks anyway. After discussing Landsverks offer internally KAFT decided that they would order Landsverk to start working on a 30 ton tank destroyer based on their own requirements. A 30 ton tank destroyer had been seen as a necessity by all parties since it was the only way to get the firepower needed against all types of tanks while still not going over the 30 ton weight limit. Since KAFT was still uncertain of what they wanted from a future tank they decided to revive the idea of a interchangeable chassis by requiring that the tank destroyer chassis also be the basis for the tank. On the 11th of February 1947 representatives of KAFT met with Landsverk´s head engineers to discuss the development of the 30 ton tank destroyer project which had now received the name TLP 47 (likely derived from the earlier LP 46 name). The meeting started with a recap of previous meetings and preparations for the project, during which Landsverk explained that they had been looking into foreign engines in the 550-600hp range but that the results were inconclusive. They also explained that they had developed a new road wheel with a matching 600mm wide track link in cooperation with Trelleborgs Gummifabrik and researched the possibility of using a track with dual center guides. Based on experiences with the Pvkv m/43 tank destroyer the ease of maintenance was seen as one of the major issues that KAFT wanted addressed with the TLP 47. Due to the front heavy design of the Pvkv m/43 its front roadwheels would wear out quickly, to avoid this KAFT recommended that steel roadwheels should be researched. The torsion bars used in the suspension were too time consuming to replace and the Czech experts had recommended to get rid of them entirely, this led KAFT to recommend the use of a suspension copied from the Churchill (one of which had been acquired for testing in 1946). After a discussion with landsverk KAFT settled on the use of a simplified torsion bar suspension instead. Though Landsverk preferred the use of a frontal transmission KAFT was convinced that the advantages of the rear mounted type outweighed any disadvantages. A rear mounted transmission offered more internal space and also made maintenance easier as the engine and transmission could be combined into one unit which could be easily switched out in case of failure. In the end it was agreed both alternatives should be worked out but that the rear mounted transmission would be the primary option. As for the transmission itself it would be based on the merit brown type gearbox from the Churchill. The TLP 47 was to be armed with a version of the 10,5cm Lvkan m/42 anti aircraft gun which would be modified for use with APDS ammunition. The main gun would also be fitted with an automatic loading mechanism fed from a 3 round tray, this would enable a very high rate of fire in short bursts. For secondary armament the TLP 47 would be equipped with a 20mm AA gun mounted on the roof. To reach a sustained top speed of 60-75 kph KAFT wanted the TLP 47 to be equipped with a 670 horsepower diesel engine, however the most powerful engine that was available was a 620hp gasoline engine from the Rover company. As a compromise KAFT agreed that the prototype would be allowed to be fitted with a gasoline engine in case an appropriate diesel engine couldn’t be found in time. With Landsverk´s new roadwheel and track link in mind a track to ground contact length of 4140mm was chosen as this would give the 30 ton vehicle a very good ground pressure of 0,5-0,6kg/cm^2. The shape of the armor remained very similar to what had been suggested earlier with a slope of around 30dg for the frontal armor and a maximum slope of 75dg for the sides. The armor thickness itself was not discussed during the meeting but earlier discussions by KAFT indicated that they planned for the frontal armor to be 80mm thick with the possibility of mounting a 50mm spaced armor plate. The mounting of spaced armor plates as protection against HEAT ammunition was discussed during the meeting and it was agreed that the vehicle would be developed with this in mind, this also extended to the mounting sideskirts outside the tracks. The development of the the 30 ton tank destroyer “TLP” & the 30 ton tank “TLS” officially started the day after the meeting on the 12th of February 1947, with the first real drawings being finished a mere four days later. Unfortunately apart from a few scraps (like the wheel layout drawing) we have been unable to find anything substantial from this period. It is possible that the more detailed drawings were burned once the project was canceled as was the case with the later EMIL project. By the middle of may 1947 KAFT took the decision to suspend the development of the 30 ton TD project. A series of tests conducted by FOA and AB Bofors with APDS ammunition had shown that a 7,5cm gun could meet KAFT´s armament requirements with the development of APDS projectiles, and by May the results were not so unclear that a final stance on the matter of weight and caliber couldn’t be taken. At this point KAFT took the stance that if the 7,5cm caliber would be found satisfactory with the new ammunition then the current Pvkv m/43 could be improved to meet the new standards, in which case a new vehicle would be unnecessary. A continuation of the 30 ton tank project was to only be considered as a backup in case the alternative proved nonviable. Landsverk received a letter explaining that the work on the 30 ton TD and tank projects would be suspended shortly on the 30th of may, thereby ending their development. This was not the end of the story however as Landsverk would include a 30 ton tank under the “Pricken” name in their 1948 export offerings. Going by the alternative of using a 620hp gasoline engine from the Rover company and the track to ground contact length of 4140mm it is a reasonably safe assumption that this was the same vehicle as the “TLS” which was the medium tank based of the “TLP” tank destroyer. Given their good mobility, situational armor and above average firepower I think that the 30 ton projects would make for a good addition to the game. In particular the LS 46 if given the 10,5cm gun would be excellent choice for a premium tier 8 medium tank that would offer something different compared to the other Swedish tier 8 medium options. The various stages of the 30 ton tank project could actually have made for their own medium branch with the Pricken m/44 at tier 6, Pricken m/48 at tier 7 and LS 46 as a tier 8 possibly leading to heavier Swedish medium projects like the Strv K and Strv A at tier 9 and 10. However given our limited knowledge of these vehicles and the fact that there exists a better alternative for completing the medium branch (which I will cover in another article) I would recommend that these vehicles be considered for the role of premiums. Armor: 70mm frontal with 20mm floor, rest to be determined in consideration of maximum weight. alternatively a 620hp gasoline engine from the Rover company or a unspecified engine from Skoda. The 105mm m/48 howitzer can alternatively be fitted. Very nice read. SP15, your continued dedication on delivering information on Swedish tanks is impressive and, for me at least, appreciated… despite how WG fucked with them in-game. SP15 from looking at the FTR articles, it’s quite obvious that there are many tanks still not implemented in WOT yet, how many other lines do you think could be made? I was guessing a turreted TD line or fork, and maybe a light line? Also the Rover 620hp engine, would that be the Meteorite engine? Original documents dont specify the engine name. Anyway yes there are like at least like 50 or so more swedish vehicles that could fit wot theroretically but im not exactly interested in helping wg impliment them coincidering how badly they fucked up with the last two lines. that said it seems like at least some kind of light tank line will probably happen no matter what. 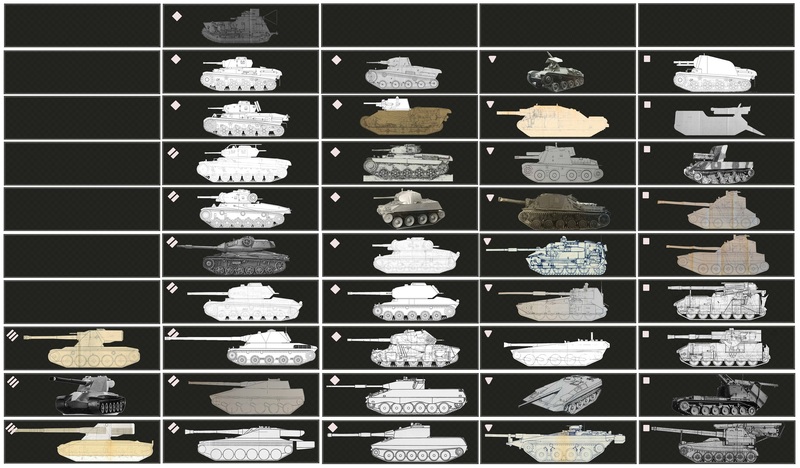 If i had to make the best of the current lines the tech tree would end up something like this, but i have no doubts WG will mess this up further because thats just how things work im afraid. Interesting, so you’d have the IKV 91 as a light line tier 10 rather than a turreted TD, I could dig that. Seems to be the theme of the swedish light tanks here to have a lot of firepower at their fingertips, I could only assume the play style in mind was a medium/tank destroyer/light tank hybrid similar to the SP1C in the german tech tree. Certainly would be versatile and interesting to play. the tier 10 heavy is not the Kranvagan? It is, those are just technical drawings… from the looks of it though its the 15cm gun though? Best we can hope is that wargaming will shuffle up the line as they develop new tanks similar to how the germans are getting their new mini maus tanks, the implementation of the T110E5/M103, and the split of russian heavies into the IS-4 and IS-7. Certainly an optimistic perspective but frankly I think wargaming has gotten away with lazy historical accuracy since most of the player base doesn’t know better about the reality of swedish tanks or to voice out against wargaming. I want those lines. And for the sake of this beautiful game fix the damn arty. Your dispersion fix ruined the game even more. As said in other posts, it would be truly awesome to have a Swedish tech tree that would be as complete as the one shown on SP15’s picture. good work sp 15 :). Nice job. Is there a publication on Swedish armour in the works? As a historian, I would be interested in such a thing.